Scientists have identified the microscopic remnants of a nearby star that exploded in a supernova immediately before or during the birth of the solar system 4.5 billion years ago. Faint traces of the supernova, found in a meteorite, account for the mysterious variations in the chemical fingerprint of chromium found from one planet and meteorite to another, according to new findings by University of Chicago cosmochemist Nicolas Dauphas and team. Scientists have known for four decades that a supernova probably occurred approximately 4.5 billion years ago, possibly triggering the birth of the sun. Their evidence: traces of aluminum 26 and iron 60, two short-lived isotopes found in meteorites but not on Earth. These isotopes could have come from a type II supernova, caused by the core-collapse of a massive star. “It seems likely that at least one massive star contributed material to the solar system or what was going to become the solar system shortly before its birth,” Meyer said. ThesScientists formerly believed that chromium 54 and other elements and their isotopic variations became evenly spread throughout the cloud of gas and dust that collapsed to form the solar system. Researchers have already extracted many type II supernova grains from meteorites, but never from a type IA supernova. The latter type involves the explosion of a small but extremely dense white-dwarf star in a binary system, one in which two stars orbit each other. It should now be possible to determine which type of supernova contributed the chromium 54 to the Orgueil meteorite. “The test will be to measure calcium 48,” Dauphas said. “You can make it in very large quantities in type Ia, but it’s very difficult to produce in type II.” So if the grains are highly enriched in calcium 48, they no doubt came from a type Ia supernova. Cosmochemists have sought the carrier of chromium 54 for the last 20 years but only recently have instrumentation advances made it possible to find it. Dauphas’s own quest began in 2002, when he began the painstaking meteorite sample-preparation process for the analysis he was finally able to complete only last year. Dauphas and his associates spent three weeks searching for chromium 54-enriched nanoparticles with an ion probe at the California Institute of Technology. “Time is very precious on those instruments and getting three weeks of instrument time is not that easy,” he said. The researchers found a hint of an excess of the chromium-54 isotope in their first session, but as luck would have it, they had to search 1,500 microscopic grains of the Orgueil and Murchison meteorites before finding just one with definitely high levels. The grain measured less than 100 nanometers in diameter — 1,000 times smaller than the diameter of a human hair. “This is smaller than all the other kinds of presolar grains that have been documented before, except for nanodiamonds that have been found here at the University of Chicago,” Dauphas said. 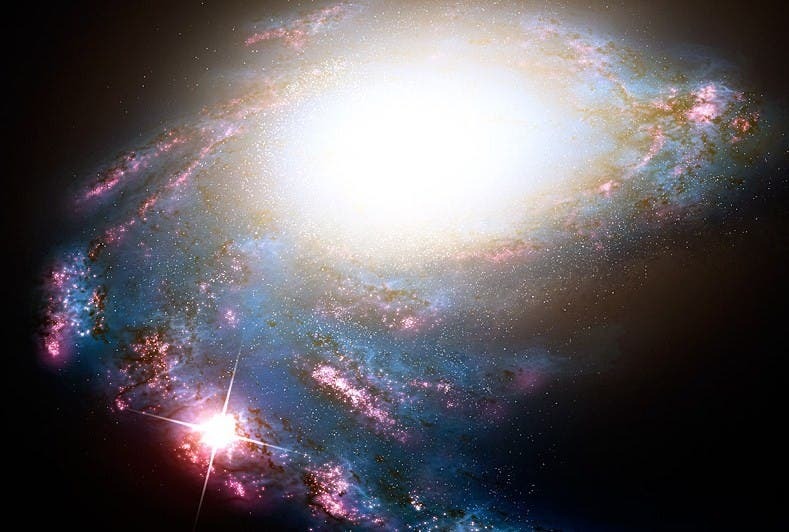 The findings suggest that a supernova sprayed a mass of finely grained particles into the cloud of gas and dust that gave birth to the solar system 4.5 billion years ago. Dynamical processes in the early solar system then sorted these grains by size. These size-sorting processes led the grains to become disproportionally incorporated into the meteorites and planets newly forming around the sun. “It’s remarkable that you can look at an isotope like chromium 54 and potentially find out a whole lot about what happened in the very first period of the solar system’s formation,” Meyer said. Image credit: 2009, Christian Jorre.